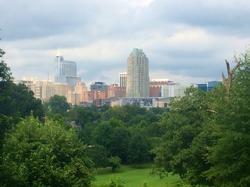 Dorothea Dix Park is open to the public daily from dawn to dusk. However, since the Department of Health and Human Services headquarters is also there, we ask that visitors be respectful of employees and avoid all buildings and parking lots during business hours. 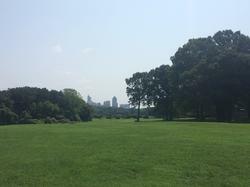 There are no public restrooms or concessions at Dorothea Dix Park. Please be prepared! All City of Raleigh ordinances and City park rules apply. The site is patrolled by both the Raleigh Police Department and State Capitol Police. The City will be leasing back large portions of the Dorothea Dix Campus to the State for their administrative operations of the NC Department of Health and Human Services (DHHS). Nearly 2,100 DHHS employees currently work on the Dorothea Dix Campus. DHHS will continue to occupy the lease-back areas of the park for up to ten (10) to twenty-five (25) more years. The City requests that you respect the lease-back areas that DHHS will continue to occupy (see map below) and their need to conduct business without interruption. A future “Public Access and Events Plan” will be developed by the City and State. This Plan will address permissible uses, days and times for access by the public of the lease-back areas of the Dorothea Dix Campus while DHHS continues to occupy it. At this time a Plan has not been completed. Until this Plan is developed, the public shall not enter any of the lease-back areas of the park. In addition to the State of NC lease back areas the City will also honor existing leases with The Healing Place, the NC State Day Care and Capital Area Soccer League.